We believe that tractor trailers, RV’s, trailers, and the like just don’t get the attention they deserve. This is why our Chrome-It line of products work great on making them glisten in the sun as they travel down the road! Our world famous original metal polish that does so much more! Quickly and easily polishes and protects all metals like aluminum, brass, copper, stainless steel, billet, gold, silver, and nickel. This product is incomparable to others on the market. It does not contain ammonia or acid, ensuring a long-lasting shine. It also won’t scratch your precious metals. Unlike other products, its affordable and it actually works! Test Chrome-It out for yourself. It cleans metals, protects metals, and removes fine scratches. Our Speed Wax is a quick detailer “On Steroids”! Speed Wax is a revolutionary new spray wax that makes waxing your ride as easy as spray and wipe. You are done in minutes, not hours. The combination of Carnauba wax, polymers, and surfactants blend perectly to provide a showroom shine in minutes. A UV blocker additive also aids in protecting againsts the sun’s damaging effects. This unique formula works on all exterior surfaces including windshields. It is great for black cars and can be used in the sunlight with no streaky mess. This product can be used a often as you like without a buildup! Our Vinyl and Rubber Cleaner and Conditioner will clean and rejuvenate your vinyl and rubber surfaces. It is not greasy and will not attract dust. 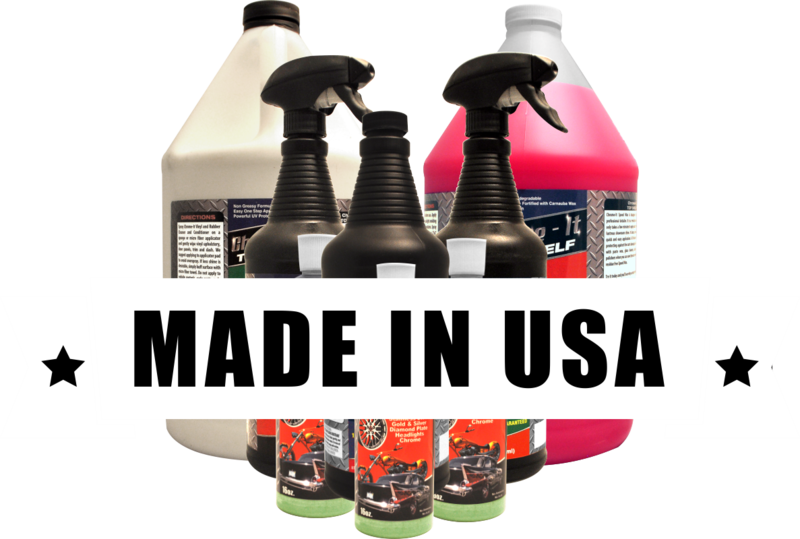 Bring back the life and color of your vehicle’s interior with this great product! Our UV protection protects your interior from damaging sun and heat. It also works great on those vinyl tops. It safely and easily removes stains, rejuvenates your interior’s glow, and restores its beauty.